254 pages | 83 B/W Illus. Covering key terms and concepts in the emerging field of posthumanism and literacy education, this volume investigates posthumanism, not as a lofty theory, but as a materialized way of knowing/becoming/doing the world. The contributors explore the ways that posthumanism helps educators better understand how students, families, and communities come to know/become/do literacies with other humans and nonhumans. Illustrative examples show how posthumanist theories are put to work in and out of school spaces as pedagogies and methodologies in literacy education. 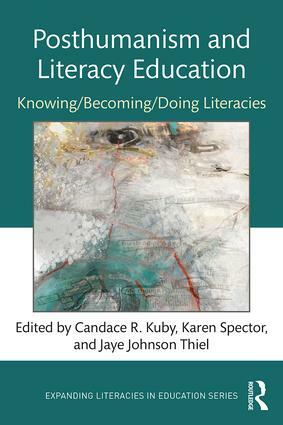 With contributions from a range of scholars, from emerging to established, and from both U.S. and international settings, the volume covers literacy practices from pre-K to adult literacy across various contexts. Chapter authors not only wrestle with methodological tensions in doing posthumanist research, but also situate it within pedagogies of teaching literacies. Inviting readers to pause, slow down, and consider posthumanist ways of thinking about agency, intra-activity, subjectivity, and affect, this book explores and experiments with new ways of seeing, understanding, and defining literacies, and allows readers to experience and intra-act with the book in ways more traditional (re)presentations do not. "This ‘full throated appeal to intra-act with posthumanist ideas’ moves bodies, shifts ideas, and unsettles assumptions. Thinking literacy education, together with critical, decolonial, Indigenous and feminist new materialist scholarship, highlights the violence of making ‘cuts too small’ when it comes to how we consider literacy practices, and cuts that exclude and marginalise. This collection invites us to imagine and speculate on what knowing/being/doing literacies are or could be." "This book is fascinating—each chapter is compelling and challenges the reader to consider what it means to live, learn and be/become literate. Constructed with great care, critical concepts from post humanist thinking are given deep consideration and then playfully remixed through diffractive composings and monstrous mutations." Candace R. Kuby is Associate Professor of Early Childhood Education at the University of Missouri, USA. Karen Spector is Associate Professor of Secondary Education Language Arts at the University of Alabama, USA. Jaye Johnson Thiel is a Visiting Research Scholar at the University of Georgia, USA.